I am a fan of both Gaiman and Pratchett and Good Omens was an enjoyable read. My favourite parts were the end notes where the authors discuss working with each other. They inspired me to search for synergy with another. I have to admit though, and this may be unpopular, I found little synergy in the story. If anything it was less funny than books by Pratchett and less weird than books by Gaiman as if they had succeeded in toning each other down, rounding off the edges, until what was produced was more commercial but less uniquely theirs. Reading it, I imagined Aziraphale as Terry Pratchett and Crowley as Gaiman, and those images worked well for me. Accessible and fun. An enjoyable read and perhaps a good entry point for both authors for a new generation. Whether you are starting a new novel, thinking about writing a novel, or stuck half way through the process, this series of articles is designed to offer help and new ways of looking at your craft. Carmilla Voiez is a horror and fantasy author. Her novels have been published by indie publishing companies including Vamptasy Publishing, CHBB and Stone Circle Publishing and her short stories have been included in anthologies by Clash Books, Weird Punk Books, Stitched Smile, Siren Magazine, and Dragones Mecanicos. Her award-winning Starblood series is being adapted into a series of graphic novels illustrated by Anna Prashkovich. She has studied creative writing with the Open University and proof-reading with Chapterhouse. Carmilla also offers individually tailored editing packages for self-publishing authors. This blog series will take you through the nine steps of writing and publishing your novel. It is designed for those of you planning your first adventure in writing, and those who feel they are missing something as they write but don’t know what. It may have some relevance to writers working on short stories, but it is designed to cover the challenges of longer pieces (50k words and over). This introduction will set out the format of the course, and list the resources I will refer to throughout the articles. You may wish to add some of these books to your own reading list, but it is not obligatory. Includes: where to find inspiration for your - story, characters, and settings. To plan or not to plan, that is one of many questions. A cost-benefit analysis of NaNoWriMo. What do you want people to think about as and after they read the story? Perspective, language, tenses and chapter lengths. Keeping going when it gets tough. Part Six – The End? Rewriting, foregrounding the themes, deciding whose story this is. Checking for consistency and avoiding unwanted repetition. Style sheets. Plugging the plot holes. Character arcs. Understanding grammar. Use a dictionary. Common errors. The role of beta readers. Do you need to pay a professional editor? Traditional vs self publishing. How to find an agent. How to snag a publisher. The elevator pitch. The dreaded synopsis. Starting something new. Release parties. Paid adverts. Building connections. Book signings. Your Facebook page. Your website. Anthologies. Goodreads. Join me on this journey through the writing process and feel free to comment on my blog if you have any specific questions related to the content or your own process. Learn the importance of a closed and an open door as you progress and start building a community of like-minded individuals who support each other’s efforts. Check out my full bibliography on Amazon. We're happy to welcome Johanne Levesque and her debut novel Trouble & Strife. 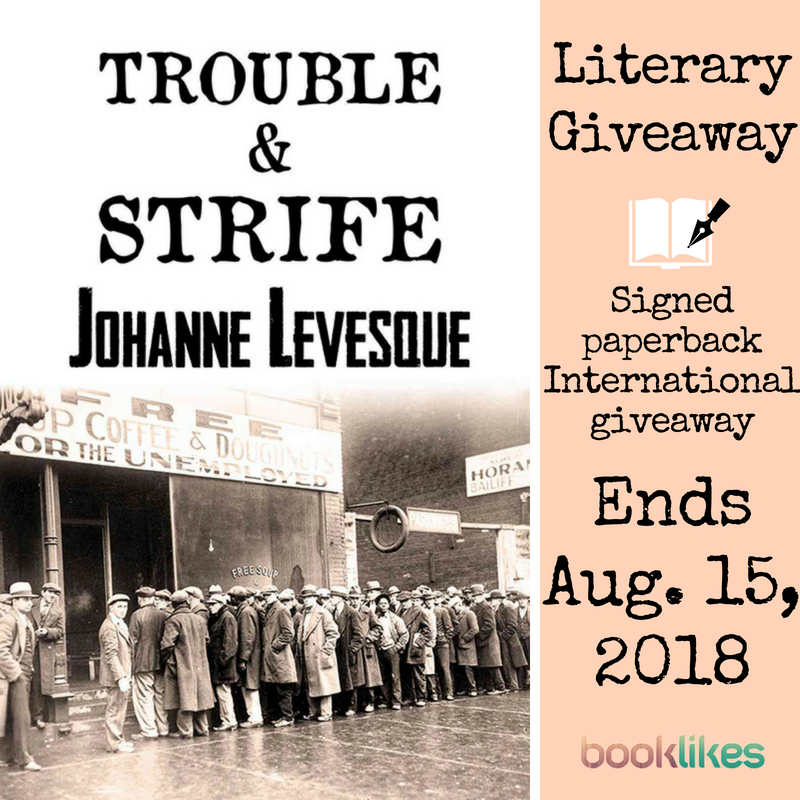 Keep on reading to get to know the author better, and win a review copy in the Trouble & Strife Giveaway. Sometimes the smallest voices make the deepest impact. Josephine Hadley, a 1930s Canadian housewife, fills her days looking after her children, her indifferent husband and a stream of Depression-era visitors. Her contribution to her guests is a bowl of stew and an open heart. Her small world, however, is soon shattered by a tragic event which forces her to become the breadwinner. Can she run a business without sacrificing herself? And is it possible to act on a long-buried desire without remorse? 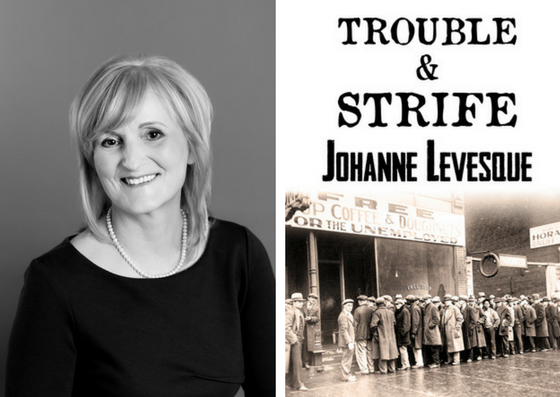 Johanne Levesque’s first novel, Trouble and Strife, is a poignant and heartbreaking look at a woman’s life in a fast-changing time. With intimate details and a deft poetic touch, Levesque has captured the spirit of an age where war and economic hardship altered the workplace, home and women’s lives forever. Yes, it was the recession in 2008. My husband was a landlord and he lost a couple properties and he sounded like Eeyore from Winnie The Pooh. I told him, “I wonder what it was like for a landlord in The Great Depression. He challenged me to write about it. Can you tell our readers more about your book Trouble and Strife, and who gonna love the story? It is about a family with four children living in Toronto Canada during the Great Depression. The husband is a landlord and the wife stays at home to take care of four children and she find ways to help others during this financial crisis. Things get more and more difficult for the family and she struggles to cope under difficult circumstances..
How did the book story emerge? Curiosity about what the Great Depression was like for people living in Toronto during the 1930’s. I riffled through archive newspaper for 10 years, going through microfiche to make the story as accurate as it could be with the historical events of the time included in the story. You studied Psychology. Do you / How do you use your knowledge and experience from the psychological field to create your stories and characters? Because I studied who what where how of human behavior I have a good grasp of motivation of my characters and why they act the way they do. I am in the process of writing the sequel of Trouble and Strife. The story will continue into the Second World War and we will see how the family copes during the difficult years of 1940-1945. In your short bio we can read I only spoke French for the first 18 years of my life. I learned to speak English by reading One Flew Over The Cuckoo's Nest using a French English dictionary for most words. Does it mean literature was always important in your life and your life decisions? I like the classics, Jane Austin, Charles Dickens, Emily Bronte, Nathaniel Hawethorne, Gustave Flaubert, Wilke Collins, Louisa M. Alcott, Leo Tolstoy, Harper Lee. They have influenced me because I love the old English way of speaking and I feel it is a pleasure and an education to read such great works. You mentioned running 7 marathons. What are you doing when not writing? I injured my Achilles tendon twice now so I am retired from running long distance. I am lucky enough to have a beach walking distance and I try to swim for one hour 5 days a week. I have a 4 month old Doberman puppy that I walk three times a day and when he is fully mature I will take him on short runs and hopefully swimming with me. I take him to obedience classes and take him to all my book shows. When he turns one year old he will take a test with the Red Cross and if he passes, he will be a Therapy Dog and we will visit retirement homes together. I volunteer with the Alzheimer Society in a program called Minds in Motion where I facilitate a group of people who have Alzheimer to exercise physically and mentally through games. It is a lot of fun and I enjoy it tremendously. 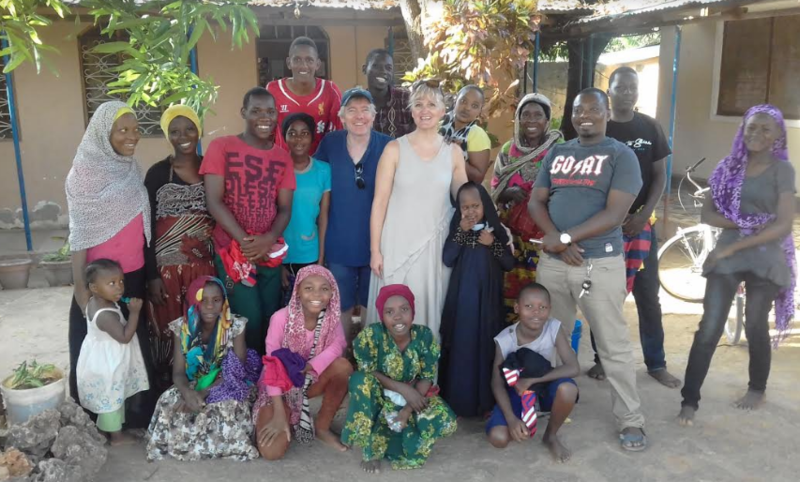 In January we always go to Tanga, Tanzania to visit an orphanage which we have sponsored for the past 5 years. We make sure they can afford to go to school, have backpacks, uniforms, shoes, tuition money. When we have extra money we do repairs on their building. We take them out somewhere. Last year we took them to a resort to dance on New years eve. And we took them on a local safari. The three book I have chosen for this trip is Drood, by Dan Simmons, Dombey and Son by Charles Dickens, A Tale of Two Cities by Charles Dickens. Always paper. I love the smell, the touch and feel of a book, I have to say I mistreat them, they are earmarked, highlighted, water stained and food stained, I use and abuse them. But I can give you a picture of my husband and I with the orphans. My husband and I with the orphans. We do a fundraiser on Go Fund Me before we leave every year and make sure each child can go to school. Even the ones who got older over the years we pay for their college too. One is studying to be a nurse and one to be a teacher. We pay for their tuition plus all things related to school.